The registration fees of all the attendees will be waived for this year. So, please make complimentary registration through the buttons below. 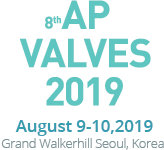 *Faculty members and Presenters will be automatically registered by the secretariat of AP VALVES 2019. Please DO NOT register via this website. An applicant for the advance registration should complete the registration by July 26 (Fri), 2019. When you are not able to attend, please let us know the cancellation of registration no later than July 26, 2019 by e-mail (cvrf@summitmd.com).